For more than two decades, Forsythes Recruitment has been successfully matching employers and job seekers in the Hunter Valley and Central Coast. With a database of over 35,000 candidates and a team of 40 consultants and support staff, Forsythes Recruitment is arguably the largest locally owned and operated recruiter in the Hunter Valley and Central Coast regions. Mid-2010 saw the company relocate from its inner city Scott Street premises to Honeysuckle, Newcastle’s renewed urban harbour-side district. This strategic move to the heart of the growth precinct signalled that the company was committed to the future of its local community and would continue to be at the forefront of innovation and growth. The move coincided with Forsythes Recruitment expanding its service offering, particularly in the area of organisational development and psychological assessment. Its trades and industrial labour hire capability were also boosted in response to the renewed mining boom and re-emerging trade skills shortage in the region. Its visual brand communication, however, had not undergone the same transformation. The creative look and feel was tired and failed to represent the strategic outlook of Forsythes Recruitment; it no longer provided tangible evidence of the company’s industry leadership status. While awareness of Forsythes Recruitment was high, few knew of the depth of talent within the company – talent that had a solid history of developing people and organisations. What Forsythes Recruitment needed was a new visual campaign that, like its relocation, would clearly embody its market leadership position, service offering and empathy with clients and candidates. The brief to engineroom design was succinct – create and deliver a through the line campaign that was modern, fresh and would appeal to both clients and candidates. The focus had to be on the needs of the role and the needs of the individual alike. Most of all, the campaign had to be simple in its delivery, be sharp and have longevity. In a saturated market, with competition from local and global agencies, Forsythes Recruitment needed a campaign with clear differentiated positioning. Forsythes is the largest independent recruiter in the region. Not only does it have strong local networks and knowledge, as a member of the global network NPA, it can also extend its service offering across Australia and indeed globally. Forsythes prides itself on not basing its consultants’ salaries on commission. This is quite rare, if not unique in the recruitment industry. Driven by outcomes and not commission, Forsythes consultants can focus on serving the best interests of their clients and/or candidates. Forsythes Recruitment provides a range of services, including psychometric testing, career counselling and HR (human resources) consulting, offering clients an array of benefits. On average, Forsythes’ staff remain with the company for five to six years. Its low staff turnover of five percent is a far cry from the industry average of 43 percent. This offers a unique opportunity for clients and candidates to build personable relationships with their consultants. All Forsythes consultants are specialists in their area of expertise. They are backed by industry experience, so have a clear working knowledge and empathy for the sector for which they are recruiting. The challenge for engineroom was how to communicate all of these identified key competencies and client benefits yet still maintain a clear, concise and single-minded message? Having benchmarked the competition and industry trends and considered the motivation of the company’s dual audience, engineroom determined that it is the depth of experience, passion and unique personal attributes of the Forsythes Recruitment team members that set the company apart and allow it to take a creative and flexible approach to addressing the needs of its clients and candidates. The tagline ‘experience our team’ was created by engineroom as the crux of the campaign. Being a direct call to action, it encourages the target market to make personal contact with the friendly professional team at Forsythes Recruitment, regardless of whether their needs are for now or for tomorrow. To further communicate the personable nature of the Forsythes Recruitment team, engineroom utilised actual employees for the talent. These individuals are not only known professionally in the industry, but also among various community and social groups, which extends their reach and resonance. Consultants were photographed in happy, relaxed stances to emphasise their approachable manner. Props and design grids were simplistic to complement, and avoid any distraction from, the key message. Quirky quotes were incorporated to provide a jovial, conversational angle. These quotes reinforced Forsythes Recruitment’s focus on building approachable and personal relationships with clients and candidates. Using the quotes as headlines, engineroom was able to tailor each individual layout to communicate a different key message. “Show me the money!” to highlight Forsythes salary survey or “Sales yes, but you’ll find no salespeople here”, emphasising that the company may recruit for sales positions but, unlike many salespeople, it doesn’t work on commission. 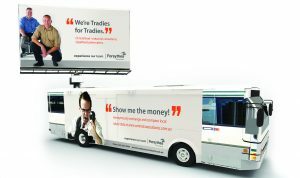 These quotes also enabled the campaign to flex and evolve as a particular key message could be dialled up or down depending on current insights or the channel of execution. The media campaign was launched in September 2011 with a specific target of the Hunter Valley and Central Coast markets. Local print publications were selected, including the Newcastle Herald, Hunter Business Review and Central Coast Business Review. Each publication has a high readership with employers and job seekers. Two billboards in high traffic areas were selected to further extend reach and exposure. To capture commuter traffic, the billboard in Mayfield West featured the line, “There is more than one way to seek”. “We’re Tradies for Tradies” was selected to target tradespeople working in the industrial area of Beresfield. The campaign frequency was weighted for launch with a progressive roll-out every month until the end of the fiscal year. 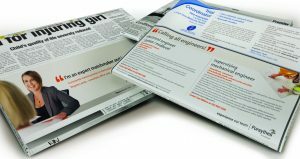 The initial launch included a variety of layouts, with Forsythes Recruitment selecting the mix of key messages to be conveyed. Social media has become an important aspect of recruiting. The look and feel of the ‘experience our team’ campaign has been applied to Forsythes Recruitment’s Facebook and Twitter accounts. The personable approach has been replicated on these online forums with more friendly rather than purely professional conversations being initiated. 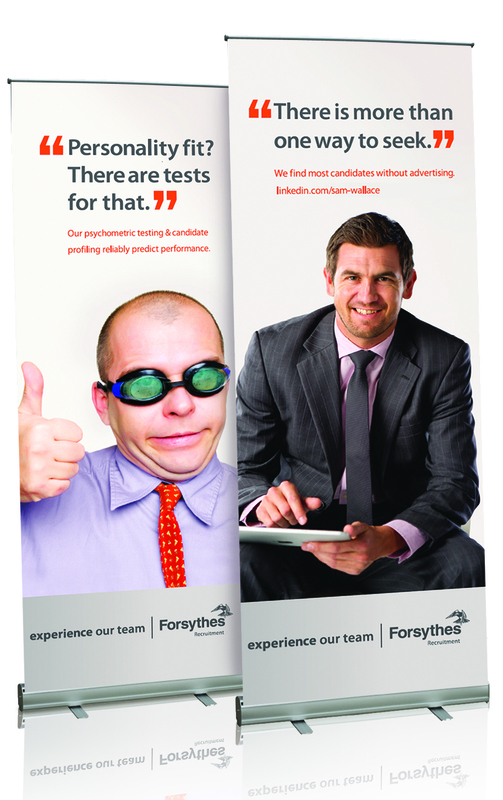 The campaign was even extended to the layout of all employment advertisements placed by Forsythes Recruitment. Incorporating quirky quotes is a new concept for the employment industry. Good-humoured lines such as “Schoolteachers raise your hand” provide light and interest to a rather lacklustre section of the newspaper. With it being a recent launch, it’s still early days for the campaign. The initial results, however, suggest an increased interest in the Forsythes Recruitment brand with a dramatic rise in web traffic. For the Salary Survey site alone, there has been a substantial spike in numbers. Visits to this site have increased by 150 percent since the September launch. An additional benefit to the campaign has been resetting the tone, internally, for Forsythes. The pride, commitment and vitality within the team are now reflected externally. The ‘experience our team’ campaign is not merely a one-off promotional campaign, but rather it embodies important brand realignment for Forsythes Recruitment and strengthens the company’s strategic positioning within the marketplace.